The soft and unconstructed silk blouse by Gerard Darel gives this Jeans and jacket look a polished easy feel. 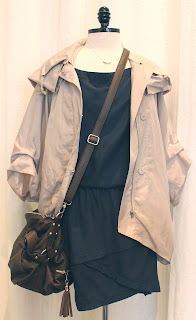 I like the soft tan anorak casually worn over a riki drop waist dark navy blue silk dress. A stunning rayon knit dress by Gerard Darel!